Last night I tweeted that none of the UK newspapers has dared to show a single cartoon from the Charlie Hebdo satirical magazine on today’s front pages. This has been retweeted over 1,500 times and counting. For the Twitter-unitiated, that is a lot. My tweet hit a nerve and I want to explain why I think that is. The Charlie Hebdo massacre was, for me, even more affecting that the usual indiscriminate Islamist terror attacks. The gunmen targeted political satirists and cartoonists – they killed the clowns. At base it was, as has been said a million times already, an attack on freedom. Charlie Hebdo is a left-wing satirical magazine. Safe to say it is anti-religious, amongst other things. It has printed many cartoons of religious leaders including of Mohammed. The magazine’s offices were firebombed in 2011 after it changed its title to Charia Hebdo (a play on Sharia, the Islamic system of law). Its staff were under constant threat but remained unbowed. A selection of covers were reproduced by a German newspaper this morning as well as others. Have a look. Some of the images are offensive and nasty, some borderline hateful, but Charlie Hebdo was not at heart a racist publication. The images of Mohammed are pretty benign. So it is legitimate to ask why none of the mainstream UK press decided to print those images on their covers, unlike for example the Belgian and German press. Instead, there was much carping about attacks on freedom and a number of photographs of a dying French policeman. There were many strong statements of support, but nobody dared show Charlie Hebdo itself or the images which prompted the massacre. The most striking cover was the Independent’s, which printed a cartoon version of Charlie Hebdo without an image on its cover, but with a hand emerging holding aloft a middle finger. This, for me, sums up the problem. The image was an attempt at defiance, but the failure to depict the true nature of Charlie Hebdo reduced the cartoon to a petulant capitulation, a pale imitation of the magazine itself. Why the mass self-censorship? I think it was two kinds of fear. The first was the fear of putting staff’s lives at risk. Fair enough. What decent employer would want to invite another massacre? The threat of Islamist terrorism is as high in London as it is in Paris, so the fear is real. It is one thing for a journalist to put their own life at risk by, for instance, reporting from a war zone, but it is another to put colleague’s lives at risk through irresponsible reporting. But the Times journalist David Aaronovitch has a point when he says that a “reason why Charlie Hebdo could be singled out for attack is because the rest of us have been cowards“. Fear, says Aaronovitch, has caused us to surrender to the terrorists by refusing to ridicule Islam. Because of a longstanding failure to print images which might cause offence or violence, publications like Charlie Hebdo became outliers which were easily singled out and targeted. There is a second kind of fear, and it is more pernicious. It is the fear of causing offence. We have become obsessed with this in the UK, to the extent that it is even illegal to cause “gross offence” on social media. I have written about this before. Indeed, people are regularly imprisoned for posting offensive jokes on Facebook. There is a line between legitimate satire and hate-mongering. I am not sure where it is though, and I am certain the police don’t know either. It is right to criminalise speech which results in violence, but we have now gone too far. Criminalising offensiveness has had a chilling effect on speech, and this has been compounded by the press’s self-censorship. Aaronovich and others are right to say that this fear dressed as tolerance has done damage to our press. It has driven certain kinds of satire underground. It probably has its roots in the Salman Rushdie controversy, but the white flag has been raised repeatedly since 1989. To an extent, our press has sold its independence in return for physical safety. Some will say that the refusal to print images of Mohammed is justified by a general enthusiasm to ridicule terrorists. But when it comes to Islamist terrorism, the two are intrinsically linked. It is impossible properly to satirise these terrorists without getting to the heart of their motivation, which is Islam – or at least, their violent version of it. It is like lampooning Hitler whilst avoiding talking about Naziism. The UK supposedly has a bold and fearless press. At least, that is the narrative we are sold… by the press. But where was that fearlessness today? Effective political satire is always dangerous, not necessarily physically but it inevitably it will be risky to the publisher. And the more effective it is, the greater danger it will cause. It seems that in the UK the press has lost its nerve. I am not here blaming the press for the massacre. That is the fault of the men who fired the guns. But this is as good at time as any to ask if our fear of causing offence is doing us damage. Today, we are not “all Charlie Hebdo“, to paraphrase the Twitter hashtag. What we are is afraid. There is no single universal value let alone method or mechanism for putting that value into action. You first create the conflict. Then you provoke . Then you get the power of many ie all press vs only charlie hebdo to crush those that are trying to point this out to you because they likely feel marginalized . And you tell them pen is mightier then the sword . They do not have the pen . They use the sword to fight back and communicate with you of your ignorance and you respond by greater ignorance and intolerance . The war is on. Ask your self . Is there not a better way to communicate that Islam does not speak to your values or even perhaps all our values than by insulting the basis on which any religion is based on . If the attack is meant to be an attack on the entire religion then charlie hebdo methodology is justifiable only. But if that is the case do not pretend to be shocked that the war is on. By the way I m not Muslim but am not anti religious. Communication is predicated on understanding the intended recipient . Who are the intended recipients that charlie is trying to communicate with and show them these flaws. Many of these I would agree with perhaps even some exist in our own religions as well. or is charlie communicating with those that already share his view and are now trying to defend hatered in good name of free speech. Perhaps the fault lies with lawmakers not piercing this issue properly.These are legitimate questions do not try to side step them .will not solve the problem. Do not become by simply blaming someone else.if your adult son does not understand something you ridicule him . The intensity of the ridicule is higher the firmer your sons belief however stupid. Is that our western value? Is that the method we would adopt to correct our adult sons behaviour. Do you not see the difference and the confusion because you are trying to argue to justify the final conclusion you have already reached in defending charlie. What is the difference between propaganda and honest speech. In propaganda you know the answer before the analysis. It does not matter if it comes from the left or right it’s wriong. “They do not have the pen.” Really? Are you really saying their only weapon is the sword? Do you realise what that implies? I won’t spell it out. There’s no need. All GPs were responsible for Harold Shipman. All white males from Yorkshire who wear track suits should answer for the crimes of Jimmy Savile. Nurses should publically denounce Beverly Allitt killing children or else be tarnished as if having committed the same offence. Crude (as is Charlie Hebdo), but hopefully the point is made. We repeatedly hear the phrases like: “We know that the vast majority of Muslims are peaceful and contribute to society” butting up against: “Muslims need to stand up and be counted (with the inference that if you are not with ‘us’ you are against ‘us’)”. You can’t have it both ways, unless you believe that all Muslims are guilty by association. Muslims are choosing to challenge and protest across the world – some of them may even by ‘Liberal’ – but they should only do so if they see this as appropriate to them and not because a predominantly white Judeo-Christian discourse tells them they should. More Muslims than non-Muslims are killed by fellow Muslims amidst the havoc in the Middle East (a region so destabilised by Western Judeo-Christian governments for a hundred plus years that for ‘us’ to define how ‘they’ should react is a further insult, I would suggest). Many of them are actually fighting the Jihadists in the real world – and paying with their lives, homes and communities; and not just having to cope with a shock to their sensibilities – as ‘we’ in the West are at the moment; that is until ‘we’ go back to talking about house prices. Yes Muslims could be part of the response, in the same way that Jews for Palestinian Right and other groups might be in addressing settler violence in the West Bank. The focus on Islam as the “heart of their (the terrorists’) motivation” is conveniently simple and prejudiced in my view. It sets aside modern day context (wars for oil, indiscriminate drone attack, manipulative Arab states and colonial hang-overs) and the injustice and disenfranchisement felt by many Europe-based Muslims – especially the younger ones. European based Muslims who take up these tactics – the so-called “self-radicalisers” – have to start somewhere. Islam is only one of a number of common factors, but one that can be manipulated to offer justification; poverty, poor social mobility and cultural isolation could be others. These murderous brothers were well-known and documented in their country (their love of alcohol was not exactly in line with their supposed faith, but let’s still identify them as ultra-Muslims anyway). Their first prompt to Jihad (which led them overseas) were the images of US soldiers abusing Iraqi prisoners in Abu Ghraib; from there the path is becoming depressingly well-worn. Lots of people are saying Charlie Hebdo has published hateful, nasty cartoons. Maybe it has. I don’t know CH that well, and am not committed in advance to defending each and every one of its cartoons. But there’s a lot of incurious criticism of it at the moment from people reacting to what they see in a cartoon at first blush. I think we need to be fair to those just murdered, and to try to understand what the cartoons really are about. You link to a Buzzfeed piece showing 12 CH covers. I want to comment on just two. First, no. 5, which Buzzfeed says is a “comment on gay marriage”. Based on that, some will see it as homophobic. But the text says “Monseigneur Vingt-Trois has got three< dads". This is an crude, bawdy attack on Cardinal Vingt-Trois (an unusual name) who was a leading opponent of gay marriage. I think a standard line that came from opponents of gay marriage in France was that you can't have "two dads". His "three dads" in the cartoon are the father, the son and the holy ghost. Second, no. 11, which Buzzfeed translates as “Untouchables. Must not mock them!”. This is no doubt unintentional, but an outrageously unfair reading. The cartoon is not calling these people "untouchables" at all. Notice (so few critics of Charlie Hebdo actually notice what is on the cartoons!) the figure 2? "Intouchables" was a very successful feelgood French comedy film, about an unlikely friendship between two men with very different social backgrounds – one of whom was a wheelchair user. This cartoon is imagining a sequel, in which a Muslim and a Jew become friends. The bubble text says "You mustn't make fun!" or, perhaps a better though looser translation, "Don't laugh!". It's perfectly reasonable to dislike CH, and maybe some of its cartoons have been racist. I don't know. I've not seen them all. But there's so much unfairness to CH at the moment, lots of it from people who just want material to support condemning these murders "but … ". We may feel uncomfortable sharing the images that got people into trouble. It’s understandable, and I’m not knocking anyone who doesn’t feel up to it or who doesn’t like the stuff. I do think there is harm in being silent, but I agree that it’s a choice. It is a sad one. The press, on the other hand, have a duty to the public interest (or so they claim), and I don’t accept as an excuse fear of causing offence as a policy guideline. I do accept fear of retaliation, which is indeed a sad state of affairs. I wish more in the mainstream press had seen fit to republish offending images the following day. But now that the dust has settled a bit, I am extremely annoyed when I read pieces that suggest CH were racist and Islamophobic, and that one can support their right to be that way without circulating the content. We owe these people at the very least to try to understand the meaning behind their pictures. And I don’t believe we can truly embrace the freedom to offend without also acting on it after such tragedy. There’s plenty of reasons for a regular person feel that – not the least that it’s kind of awkward to honour people by violating their copyright. Not distributing cartoons is not the same as being silent. Are you suggesting that the vast majority of the one million people marching in Paris today were silent? It has little to do with fear. It’s not in the public interest to offend people for offending’s sake, and a simple repetition of already-published cartoons is nothing but that. Why? What purpose would that serve? These cartoons have already been published. All that does it slapping the thousands of Muslim in the face who were also marching today. Yes, we can. You are confusing the freedom to offen with a duty to offend. There is no such thing. If that statement were not so ridiculous on its face, it would be hilarious. 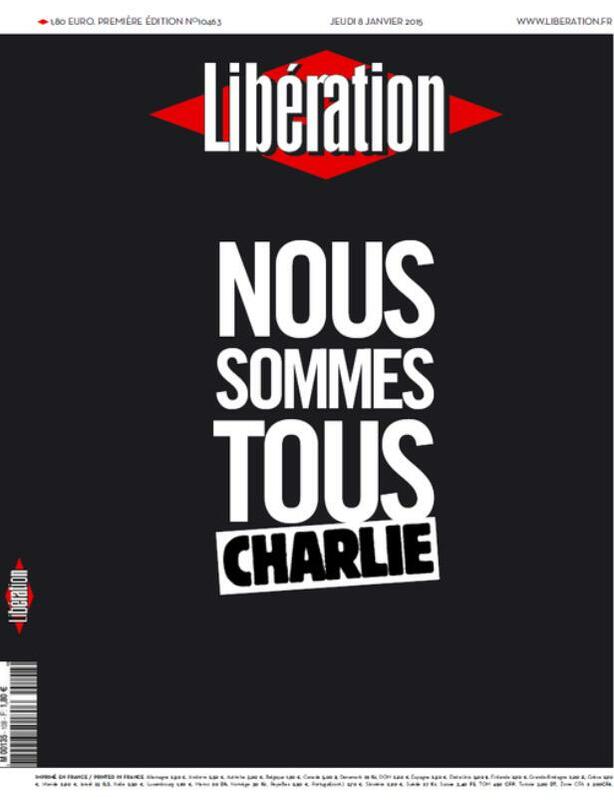 Charlie Hebdo publish their own covers on their Twitter stream for sharing. Nevertheless, yes, another publication should not publish them without permission, although when they are central to the story it is arguably fair use. Foremost, I can fairly say that protecting their copyright on past issues is hardly a priority for the magazine and its dead cartoonists at the moment. Sorry to be blunt, but this remark is bordering on contemptible. I completely and utterly disagree with any suggestion that it is offending for it’s own sake, and you’re not going to persuade me otherwise. Our differing views on this are the result of either different core values or the priorities we place on them. My values are where I want them to be. I attach a great weight to freedom of expression, because I believe that free speech is the cornerstone of democratic life upon which all other rights depend. Consider that offence is taken, not given. Offence can and often is taken over acts of speech that were not intended to cause it. That is the primary democratic need giving rise to the right to cause offence. Finally, no, I am not confusing a right to offend with a duty to offend. We must be free to depict Muhammad. In a world where all we feel able to do is discuss this, the freedom to offend is an illusion. I have said all I intend to say about this. Too bad that fair use doesn’t exist in many civil law countries. Ah, right, because laws are only important when it’s convenient for you? So? What would be the relevance of that? Aside from the fact that you show precious little democratic spirit by believing yourself to hold enough authority to declare entire constitutions null and void, you do not argue for free speech either by arguing that others HAVE TO speak what you want them to speak. Just because we are free to do so doesn’t mean that anyone should feel obliged to do so. You’re also free to whistle after women on the street. That doesn’t mean it should become a general habit. The argument is profoundly misconceived. The whole point of freedom of speech is to convey our opinions. Why convey an opinion that we disagree with, or a method of expression of this opinion that we don’t wish to convey because we don’t want to give offence? If others wish to do so, that’s their prerogative. But the idea that there is some kind of moral obligation to publish the cartoons is antithetical to the freedom of speech that it purports to defend. Where are all the liberal Muslims out there who should be condemning the Charlie Hebdo atrocity? I have the common sense NOT to condemn a whole religion for the actions of a few who would also claim to be true Muslims, in their own minds they certainly think they are and also obeying the Koran. But what really gets me is that there are no protests or demonstrations by liberal Muslims condemning the attacks, where are they all? When Gaza is attacked by the IDF and innocent men, women and children die in the most ghastly ways then liberal Muslims certainly protest, and in their thousands world wide, and rightfully so, I approve of such protests. The question is, If it is Muslims are prepared to protest at those atrocities then why are they not prepared to demonstrate, and show solidarity with the freedom of speech, over the killing of the innocents, the Charlie Hebdo Victims? That same day thousands of Parisians came out onto the streets, at Notre Damn Cathedral and else where, I was very disappointed to see that very few Muslims turned up, although I cannot state categorically that none were there, but this surely would have been an opportune time for them to have turned up, and en masse, to show their condemnation of such barbarity. But More importantly to show France and the French people that such terrorists will not and DO NOT represent them or their religion of Islam. Can you imagine a scenario where some extreme over zealous ‘Catholics’ decided to slaughter innocent people because they were offended over some cartoon images satirizing their beloved leader, The Pope? So these particular Catholics decide to force their way into the office of the cartoonists and journalists and kill them all, with no mercy whatsoever. If such a scenario was to happen I can positively state and assure you that within hours of its occurrence that tens of thousands of Catholics would be gathering in Rome at St Peters Square and across the Catholic world, armed not with guns, but with placards that read “Not in my name!” As if to say… JE SUIS CHARLIE… I am Charlie! But are you? I want to state here and now that I am NOT a Catholic, I am not a Muslim either, but if I were a Muslim I would be moving Heaven and Earth to align myself with the normal person on the streets of Paris to show, (regardless of my religion) my solidarity, my sympathy, my horror that such evil could take place, and incidentally, in the name of my religion. You have the right to believe in fairies down the garden if you want to, the right to publish news that pink Elephants created the world, I may laugh and ridicule, but I will NOT take away your right to believe whatever you choose to believe. I will not prevent you from writing about them, in fact I will defend your right to publish your crazy ideas (For ideas never harmed anyone) even though I think they are absurd. Finally and most importantly. I WILL NOT MURDER YOU FOR WHAT EVER YOU BELIEVE IN! Many liberal Muslims have spoken up and do speak up. Others are quite possibly afraid of the repercussions of doing so from the extreme wing that we also complain of. Muslims who disavow the fundamentalist view suffer retaliation as well. In fact, when you think about it, most of the people being killed by Islamic fundamentalists today are Muslims. That’s just mostly not happening here in the West. So what say we just chill out a bit? As soon as someone starts inferring that one is NOT chilled out, as you put it, then I start to suspect that accusations of one not having pure motives may follow. Speaking for myself, no one is more chilled than I am. This, issue here referred to, needs a mature calm approach and far too many try to shut down any discussion of it, with accusations of racism, Islamaphobia, etc. I would like to state that I suffer from none of them. Not that you were accusing me of such, I am sure of that. But what is needed is for moderate Muslims to get out there in their thousands to make their own protest against the Paris horror that took place, if not join in with the mainstream. I cannot stress enough that they need to be there and this will go a long way in preventing any stupid backlash, especially from the ignorant racists in society. I am aware that many Muslim spokesmen have condemned the terrorist attack, this is good. However, I feel that more is needed from them by way of public shows on the streets of their disapproval of what is being supposedly done in their name as a religion. The more noteworthy spokesmen have made this point themselves during interviews with the media, which I have seen on line. So, I am not the only one making this point, they admit that more needs to be done than mere condemnation. What a shot in the foot it would be for the terrorists to see that Islamic people have gathered against them, as if motivated them, to stand against them in their thousands if not millions on the streets. This would do so much in allaying peoples fears, although fears not founded in reality. Sure. Because you are the appropriate person to judge that. Nope. Since that has already happened. Highly dishonest to hijack them and distort their statements. The big demonstrations regarding Charlie Hebdo in France are today, and demonstrations are not organized within minutes, let alone legally. You are the best demonstration that this is not the case. You artificially construct justifications by ignoring what does not fit into your agenda and distorting statements of others. Demonstrations have happened in the past on multiple occasions and they have been consequently ignored by people such as you. I could waste my time and yours by answering you, but with respect I won’t. I detect in your manner one who is quick to judge others and not really interested in finding solutions to this huge problem, not to mention your personal attacks on my honesty and veracity. I wish you peace, by God we need it, but I will spend my time better I think with those who do not attack, but debate in honesty for the sake of mankind and civilisation. I don’t see how in good conscience I can expect moderate Muslims to put themselves at greater risk than they already are just so that I can feel more comfortable sharing a public space with them. We are by no means the greatest victims of Islamic terrorism. I agree with that statement, however many who live in that illusionary condition of fear may need some reassurance, and to allay those wrong fears, then why not also humour them for the sake of peace and the moderates could certainly do that and why not indeed! It’s one thing for a liberal Muslim to bravely call on his fellows to join him taking a risky stand against extremism. It’s quite another for you and me to ask that. We may ask, but we should understand what we are asking for. We are asking them to risk the label “takfir”, for which strict Islamic law calls for death as an apostate. Contrary to your assertion, it will not bring peace. Matt I have to say that I disagree with that, and I never said that if the moderate Muslims organised a mass protest against the terrorists that are hijacking their religion wrongfully, that it would would bring peace, but it would help to. But I will tell you this, the difference between the many me’s demonstrating and of Muslims doing it, well that would surely have more influence and power in the minds of the terrorists, can you not see that for every 100 none Muslim protesting, 1 Moderate Muslim in them selves would equal their force, thereby accomplish more, and besides the terrorists are certainly not going to be persuaded by the white western world demonstrating, the UK, USA, France…etc, that obviously would have little influence whatsoever with these mad men? They hate us anyway. The only people that could have any possible chance of making the extremists think or listen, would be members of their own faith, and they to me are the moderates. This is my belief and I think that if enough came out onto the streets, then something might happen, the others (me and none Muslims) can protest until we are blue in the face, the extremists will continue to mock us anyway, this might not be the case if their own brethren condemned them en masse. What really gets me is how this is repeated time and time again and only goes to demonstrate that the liberal Muslims could protest and demonstrate all they want, it is going to be ignored by people for whom what must not be cannot be. Already in September, hundreds of Muslim in Paris demonstrated against ISIS. ISIS is being ridiculed in some majority Islamic states in the media. But people who want to believe that liberal Muslim don’t protest simply ignore that. Incidentally, in Mannheim, Germany, there was a joint Christian-Jewish-Muslim prayer service today for the victims. For Tuesday the central council of Muslim in Germany has announced a vigil in front of the French Embassy in Berlin. French Muslim organisations have publicly condmened terrorists. Even the family of Amedy Coulibaly has denounced his actions. But that, for you, is evidently “No protests or demonstrations by liberal Muslims”. And with that attitude, you wonder why they feel marginalized, even persecuted? You have completely missed my point and spent more time in attacking my motives than anything else, this is the usual thing I find. I never said that The moderate Muslim spokesmen have not condemned the Paris attack, indeed they have and on line and on the media. What I am looking for is what many leading Muslim leaders have already said, and that is to make their presence felt on the streets by way of a vigil or something organized by many of the Mosques, this would be, how can I put this, it would be a Muslim show of defiance against those who are high jacking the religion they love so much. Stop judging me, just think about it as I will not judge you. You are looking at words on a screen, not at the peace in my heart. And how would you know about such things happening? This Friday, German Muslims held vigils in front of countless press outlets in Germany. On Tuesday, there was a vigil by German Muslims in front of the French embassy. Where are all the liberal Muslims out there who should be condemning the Charlie Hebdo atrocity? I have the sense not to condemn a whole religion for the actions of a few who claim to be true Muslims, in their own minds they certainly think they are and obeying the Koran. But what really gets me is that there are no protests or demonstrations by liberal Muslims condemning the attacks, where are they all? When Gaza is attacked by the IDF and innocent men, women and children die in the most ghastly ways then liberal Muslims certainly protest, and in their thousands world wide, and rightfully so, I approve of such protests. The question is, If it is they are prepared to protest at those atrocities then why are they not prepared to demonstrate, and show solidarity with freedom of speech, over the killing of the innocent, the Charlie Hebdo Victims? Thousands of Parisians came out onto the streets, at Notre Damn and else where, I was very disappointed to see that very few Muslims turned up, although I cannot state categorically then none were there, but this would have been an opportune time for them to have turned up, en masse, to show their condemnation of such barbarity and. But More importantly to show France and the French people that such terrorists will not and do not represent them or their religion of Islam. Can you imagine a scenario where some extreme over zealous ‘Catholics’ decided to slaughter innocent people because they were offended over some cartoon images satirizing their beloved leader, The Pope? So these particular Catholics decide to force their way into the office of the cartoonists and journalists and kill them all, with no mercy whatsoever. If such a scenario was to happen I can positively state and assure you that within hours of its occurrence that tens of thousands of Catholics would be gathering in Rome at St Peters Square armed not with guns, but with placards that read “Not in our name!”. You say that the reason UK newspapers have not published the cartoons is out of fear, but that just seems to be an assumption you’ve made, neither you or I know what happened in the editorial meeting where this question was no doubt discussed. and given that it put itself at much more risk by publishing Edward Snowden’s revelations one can hardly accuse the Guardian of cowardice. My own position is similar – I’m uncomfortable with some of the cartoons and so won’t be joining those tweeting them in solidarity even though I would strongly defend CH’s right to publish them. The notion that if I did so some Islamist nutter might hunt me down and get their revenge is absurd, so it’s nothing to fear about being afraid. “Much more risk”? You think GCHQ’s going to liquidate Guardian journalists because of its reporting on Edward Snowden? I must echo the sentiments of many of the respondents here. As a Muslim, I find such cartoons deeply offensive to my faith and sense of identity. They do not make the distinction between the bastardised version of Islam these terrorists promote, and the value system which I hold as my own. There is nothing in the Qur’an or in the writings of the Prophet’s life which could in any way condone the actions of these terrorists, the concept of blasphemy has no basis in the fundamental Islamic texts. Having said that, satirists have a right to express whatever opinion they choose, including reproducing the warped version of Islam this minority promotes, and they have the freedom to do so without being murdered for it. I feel even more offended by the actions of these terrorists, their actions are an even greater insult to my faith and to the Prophet in whose name they conducted themselves. But I take issue with the suggestion that reproducing these cartoons in Britain would somehow be an affirmation of free speech. On the contrary, simply reproducing these cartoons here would send the message to British Muslims: if you are offended by this, you can’t stomach free speech. I can’t think of something that would make me feel more victimised or excluded from a society of which I feel wholly and proudly a part. I agree with the comment above, free speech in an increasingly globalised society is a deeply complex issue. Quite the contrary, the British press are head strong and refuse to be censored and will show no restraint in exercising free speech when publishing a story……. when hacking a dead school girl’s phone or publishing photos of a celebrity’s breasts. Are you joking? Muslims are constantly attacked and criticised in the mainstream press on a regular basis. There is no shortage of newspaper articles lampooning them. I’m surprised by this blog post – I mean, so many bad newspaper stories about the Human Rights Act occur because the newspaper in question wants to make it seem like some BIG SCARY MUSLIMS over there are getting something and DECENT HARD-WORKING BRITISH CITIZENS get nothing. Our press is virulently anti-Muslim and from that very intolerant of the basic freedoms that underlie the HRA. To confirm the first type of fear that Adam has defined, some papers have actually claimed to be afraid of reprisals. But, I fear that this could be a mealy mouthed response. The fact that most of the newspaper sales network is dominated by a certain demographic, and, anything that “offends” these people is likely to adversely affect the newspapers somewhat precarious cash-flow is a more likely reason for failing to support Charlie Hebdo. This is an indirect example of the second type of fear that Adam discusses. We saw quite a lot of the employment culture within the press industry during the phone hacking trials. They did not strike me as altruistic employers. I think that the decision not to put Charlie Hebdo cartoons on the front pages could have been motivated primarily by basic economics. Newspapers are frequently distributed to newsagents on a “sale or return” basis. Had our press followed the example of our European neighbours there is a likelihood that there would have been rather more returns than sales. I agree “There is a line between legitimate satire and hate-mongering. I am not sure where it is though, and I am certain the police don’t know either.” What I do know if that the right to legitimate satire must also be tempered by asking the question, what do wish to achieve by this satire? Is it make people think, to reflect, to challenge legitimate authority, or is it merely to cause offense and thereby provoke a reaction? We may have a right to offend, to be satirical, to freedom of the press and expression, this does not mean that in all circumstances we should exercise it, particularly if the context is a hateful and prejudicial environment against a group of people who might legitimately find offended, but also at the same time reinforces their alienation and exclusion from a society that they see as increasingly hostile to them. It has been said that we have the right to fart; but does this mean we should fart in lift or enclosed space that causes discomfort and offense to others? We are currently living in very dangerous times, with rampant Islamophobia, xenophobia and growing racism and fascistic/intolerant tendencies. We should be mindful of the consequences of what we do, however “innocent” or benign. Context here is so important. I do not want to live in a society which we feel we all have a right to offend or hurt others by our words or deeds. Some may see this a self-censorship. I see it as a price we all pay, a compromise, to leave peacefully and respectfully alongside others who we may disagree with. Our freedom of speech must be tempered by our willingness to consider the complex effects of what we do on the lives and freedoms of others. The news yesterday morning triggered one of those moments which causes me to question some of my fundamental beliefs. Numerous images over the past 24 hours have reminded me that we like to proclaim that the pen is mightier than the sword. And yet we regulate the sword whilst demanding (almost) complete freedom to wound with the pen. I believe in freedom of speech for a reason. Does that reason include the right to hurt those for whom words can cause real suffering? Those who murder as a response to their offended sensibilities cannot be tolerated. But is the right response to their actions to publish more of the images that inflamed them in the first place? It’s not just cowardice that dictates a different response. It is the thought that, if there are people out there made angry enough to respond with a gun, how many more might be angry? Today, I have only questions. I would be surprised if the answer lies in encouraging the press to be more willing to offend. Amen. Freedom of speech is just that -. FREEDOM of speech. Suggesting that people MUST voice an opinion which may not be their own has nothing to do with freedom of speech. And freedom of speech also is the freedom not to speak. It’s true, we must protect our English cartoonists: Morph, Chas, Wallace, Gromit, Rolf – they are all national institutions. You have just compared Islam to Naziism. Would you have done similar regarding Judaism when discussing the murder of Palestinians or Buddhism regarding the murder of Muslims? In fact, if you saw a comparison between Judaism, Jewish extremists (such as Naftali Bennett or any Kahanist) and their ideology (Judaism; Jewish texts) and Nazis and Naziism, what would your reaction be? NB I’m not assuming any reaction from you on the basis of faith or race. I was very clear to separate the terrorists’ version of islam, which undoubtedly motivates them. I think naziism in particular and fascism in gereral is an excellent comparison for their ideology. Let’s all stop calling it Islam or Islamism and call it Sharia. That’s what it is. It is oppressive religious criminal and civil law that has spilled into societies in which that is not part of our process. It is the antithesis of modernity and I can’t see how it can be tolerated in a liberal democracy. The idea of it, yeah, but not the implementation. Sharia may not even be the best term, as I’ve been informed of Islamic Constitutionalism, i.e Tunisia, incorporating Sharia law but enshrining basic freedoms that are familiar to us. And I’d like to add my voice to those who are afraid. I would like to be fearless in this, but it’s hard. Well written and well said, I agree with all of it. The world press should be bold in exposing the extremist Satanic evil nature of some involved within Islam. I disagree. Charlie Hebdo is a satirical paper. As such, provocative ridicule is their bread and butter. That’s not the case for your average newspaper which may have one or two caricatures/cartoons per issue. Of all the topics possible for these, daily politics is still the one that has the most impact for the readership, far more so, contrary to belief of islamophobes, than even radical Islam. I disagree again. Because the distinction “their violent version of it” is routinely not made. What we’re instead all too often talking about is equivalent to using the tired image of the “Huns” for Germans while wondering why, say, members of the Social Democrats, themselves persecuted by Hitler, should feel from awkward to insulted and would PREFER if you don’t do it. One could also make an example that makes it more evident – Meyer Lansky, Dutch Schultz & Cie were all doubtlessly both hardened mobsters and Jews. But people would rather feel awkward for very good historical reasons if people started to portray Jews as mobsters as a rule. The problem, in the end, is that the failure to properly distinguish between terrorists and Islam can be seen with some justification as nothing more than buying the claims of the terrorists hook, rope and sinker – it’s declaring they speak for Islam. So while one might appreciate the work Charlie Hebdo has done, that doesn’t mean one has to consider it imperative to join in the effort. There are plenty of ways to criticize. And no, I am not afraid. I’m upset about a cruel criminal act that has no justification whatsoever. But the same statistics that tell me that there’s a billion Muslim in the world also tell me that the violently radical part of them seems to be so small that in any given location, especially in the western world, people fall victim to it only once under a blue moon. Far from the threat it’s made up to be. Ironically, Muslim are far more likely to fall prey to Muslim terror attacks. But we don’t talk about that as much because we don’t feel threatened by 60 people being injured and 30 killed in Sanaa. And THAT is a problem. Two of the victims in Paris yesterday had names that suggest that they, too, come from Muslim families. One was a journalist at Charlie Hebdo. The other a police officer. How do we say “We are Charlie” and at the same time throw two of the victims in with their murderers? Aaronovitch supported May banning Dieudonne for allegedly being ‘anti-semetic’ , so was presumably up in arms over CharlieHebdo’s ‘ShoaAnanas’ spread – he doesn’t even speak French. Odd. Re-imagine the scenario. An extremist campaigner for equality in the UK (be it gender, LGBT, race, social etc.) orchestrates a similar attack on Katie Hopkins, for her latest Tweet about how working immigrant women are too fat and smoke too much (or whatever she’s likely to spout). Is it the press’ duty to repost the hoard of ill-advised, trolling comments she’s amassed over the years on their front pages in tribute to her right to say them? To publish comments that openly offend people within our society and create a martyr of someone who liked to joke & rile people up for fun and clicks? I believe it isn’t. It’s possible to champion someone’s ability to say what they want without subscribing to their view. The magazine itself was inflammatory as you’ve rightly pointed out – but that was their editorial decision. Any media outlet publishing images from Charlie Hebdo on their front page could be mistakenly seen as aligning themselves with their views as opposed to aligning themselves with their right to satirize aggressively. Using their illustrator’s responses succinctly gives the message that they are championing free speech without the need for political alignment. The point made by publishing the cartoons is that we should not fear death in doing so. The point made by not publishing the cartoons is that we do. Making the former point and disavowing the latter point are together and separately more important than any misunderstanding. All this is perfectly true, and I am alarmed by some of my friends who seem to think that asking newspapers around the world to reproduce the cartoons on their covers is, at best, inviting trouble and needless hurt, or at worst actually somehow racist and bigoted by disrespecting all of Islam. The speech acts that have offended need to be multiplied to help decrease sensitivity. That’s really the only way. The opposite is happening, allowing sensitivity to flourish. And I’m alarmed by your dismissing that notion so readily. If you believe you decrease sensitivity by that, you really have a rather weird view of how people function. And not very good manners. Nope. Civilized discourse allows a plethora of means not all involve putting the baby out with the bathwater. Charlie Hebdo had every right to do what they did and that right needs to be defended. It is entirely unnecessary, however, to copy what they did. Quite the contrary, it’s a perversion of freedom of opinion and freedom of speech, NOT a defense. You can disagree with me, and you can call me rude. That’s fine. Most of the people who decided to rate your comment gave it a down vote, more than 3 to 1. That doesn’t mean you’re wrong, and it doesn’t mean I’m right. Consider that 1000 years ago I would have been thrown onto a pyre for denying the divinity of Christ. Islam is at the same point in its history now that Christianity was during the crusades. I make that point because time and struggle changes attitudes. We cannot live in a society where there is a fear of death attached to the publication of some even arguably innocuous material and call it liberal. That fear does not make us liberal. It underestimates the people we may think we are trying to protect by supposing that they don’t have the fortitude to see their deeply held beliefs held up to ridicule. It supposes they are no better than children who can’t help but lash out violently when offended. Is that not racism? I don’t propose we rub the noses of good people in the blasphemous material that may cause them upset. I don’t suggest we voice blasphemous opinions directly to the faces of followers of a religion. That’s not what Charlie Hebdo were doing. They were publishing, which means putting ideas, though painful to some, into the public domain. The more commonplace that becomes, the less controversial. How can it be otherwise? …also, the laws on race hatred are vastly different in France and England: we (as yet) haven’t adopted the Holocaust and Genocide Denial laws like France – worth reading up on these Adam….vast differences across the EU http://en.wikipedia.org/wiki/Laws_against_Holocaust_denial#France – and Dieudonne was barred from this country for lampooning these laws + the Israeli government who purchased them from the ‘Elite’ in the French government. CharlieHebdo supported him in this – yet this was dismissed as ‘AntiSemetism’ rather than political (anti-Zionist) commentary by people who do not even speak French. The idea that Charlie Hebdo “supports” the revolting Dieudonné in anything is ridiculous, as is the idea that he was excluded from this country for criticising any laws. I speak French, and understand why Charlie Hebdo is very insulting about Dieudonné, the inventer of the 21st-century idiot’s version of the Hitler salute. Few people have ever been more deserving of insult than him.